Ask any St. Simons Island real estate agent about the area and youâ€™ll quickly learn that itâ€™s a spirited place to dwell. The region is known for its colorful legends, including those surrounding the tree spirits. They are not ethereal beings known to shiver a soul or two. Rather they are living works of art designed to honor the islandâ€™s maritime dead. 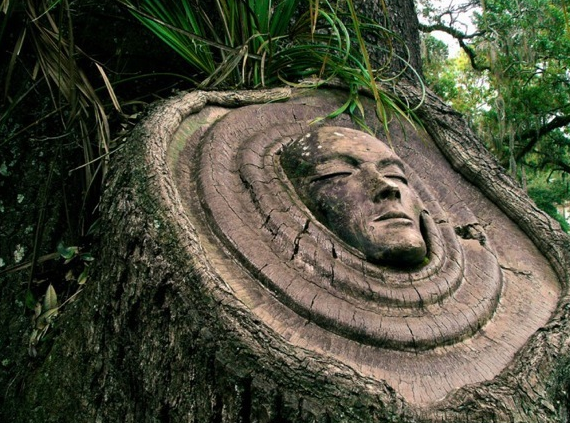 The spirits, which were created by local artist Keith Jennings, may be found carved into trees located all across St. Simons Island. We should also mention that over the years, as the trees have continued to grow, his haunting artwork has taken on a whole new dimension. Some of the earlier carvings have turned dark or been kissed by southern moss. Others have almost disappeared altogether. Maps of their locations are available. However, merely stumbling upon them during other island activities tends to make the experience much more enjoyable. If you do decide to go in search of the tree spirits, consider adding a few related destinations onto your itinerary too. One worth considering is the St. Simonâ€™s Lighthouse. On a good day, youâ€™ll be able to envision what life was like working as a light keeper in the 1880s. The lighthouse is also home to a maritime museum where you can reflect further on those who were lost at sea. Other spirited activities to engage in with the family are evening ghost walks and the ghost trolley tours. Unlike the mournful tree spirits, the lamp-lit ghost walks and trolley tours are apt to quicken your pulse. Spirited former residents that you may encounter are the lighthouse keeper, lovesick Mary, the lady of Christ Church and the men from Eboâ€™s Landing. While in the area, you may also want to consider taking a ride aboard a working shrimp boat known as the Lady Jane. It will help to give you some idea of what it was like to work at sea and how sweet the fruitâ€™s of oneâ€™s labors can taste. Would you like to uncover more reasons why the area is a spirited place to dwell? Contact us at DeLoach Sotherbyâ€™s International Realty. Our St. Simons Island real estate professionals would love to expound further on the regionâ€™s charms.